I have been racing Triathlon for many years now and when I first started out I was a bit overwhelmed with the amount of gear I needed – well I thought I needed anyway. One of the more expensive items on my list was a wetsuit and today we look at the best entry level triathlon wetsuit money can buy. There are a lot of races that won’t even let you into the water without a wetsuit – due to the low temperatures so it’s a bit of kit you can’t do without. Plus if you aren’t the best swimmer out there you will be glad of the extra buoyancy you get from a wetsuit. I started searching online and found a lot of rubbish to be honest so set about creating a review for beginner triathlon wetsuits so you don’t have to go through the same pain that I did. Here is a quick summary of our top triathlon wetsuits for beginners. We will go into detail on each one further down the page. What to look for in a wetsuit for Triathlon? One thing that you will notice immediately is that even at this lower end of the price range all the top brands are in there. This just shows how things have moved on since I started. My first wetsuit was great but not ideal for triathlon – at the time it was all I could afford. It is still in great condition and I use it for practicing all of the time. Most important of the lot is the fit of the wetsuit. The wetsuit should be a snug fit with no gaps or looseness at the small of your back but not so tight that you can’t stand up fully without is tearing into your shoulders or crotch area. The zipper should be flat on your back and easy to open and close by yourself. It should feel very strong and be made of heavy duty materials. The seams around the zipper should be sealed and flush to your back as well. All good tri wetsuits will sport a good zipper and the ones above are no exception. The seams of the wetsuit should be smooth and flat with some wetsuits providing an additional layer of protection in the way of seam tape to cover everything up nicely. The first thing to go on any wetsuit will be one of the seams so make sure your suit is a reputable brand and you have nothing to worry about. All good suits have some additional buoyancy panels built into the design. These are great for helping you stay afloat but just make sure they do not hamper your swim stroke in any way. Flexibility is crucial for a couple of reasons. Firstly these wetsuits can be a nightmare to get on before a race. Use a bit of body glide if you are having trouble. You also need to be able to get the thing off after the swim. You also need to be able to get the thing off after the swim. This becomes even more challenging because you are trying to remove it while you are running into the transition area to start your bike leg. I have seen more people struggle at this stage of the race than anywhere else. Also, remember that you are going to be wearing your tri suit under the wetsuit for speed in transition so make sure everything fits properly and still gives you free arm movement. Check out this post to see what to wear under your wetsuit. I have to admit I’m not the best swimmer in the world so can use all the help I can get. Having a nice buoyant wetsuit on during the swim is a great help. All modern wetsuits have additional buoyancy panels built in so happy days. My original suit didn’t have these luxuries but was that thick it was like a dry suit and I would have needed a weight belt to get it to sink. Believe me, I relied on it a few times. If you are looking for the best triathlon wetsuit for a poor swimmer then something with as much buoyancy as possible will really help you out. This approach does have some downsides though. The heavier wetsuits tend to be more restrictive around the upper arm area and are not the best once you master the art of freestyle swimming. What you are looking for is a wetsuit with buoyancy panels included that do not hamper your swim stroke in any way. Any of the wetsuits in the comparison table below will cover this for you so nothing to worry about. Let’s face it. Your wetsuit is most likely going to be the second most expensive purchase you make, number 1 being your bike, so you want to make sure it last you for a long time. With the brands listed above, you are getting premium quality at very affordable prices and the features are designed for their top wetsuits that can run well over $1000 a piece. There are no spurious knock-off suits listed that you may find elsewhere. These are premium wetsuits from top-flight Triathlon Gear companies. There are a few things you can do to extend the life of your wetsuit and keep it in tip-top condition for the next race. Always wash your suit after every race. This is just as important for freshwater swims as it is for saltwater racing. In freshwater, you will pick up all sorts of grime and much getting in and out of the water and if the water level is low you are probably going to be swimming through some weed beds at some stage of the race. It is very important after a Sea swim to wash the wetsuit thoroughly and remove all traces of salt from both the inside and outside. I usually hang mine in the shower and give it a good scrub down with a soft cloth after each race. Just make sure the wetsuit is fully dry before you pack it away. Another thing you can do after the suit ages a bit is to lubricate the zipper lightly. This might seem trivial but you will be glad you did when you are trying to get the darned thing off you in the transition area. While this may be classed as an entry level wetsuit the Blueseventy Sprint has all the features you would expect in a high-end tri wetsuit. Tri Wetsuits have really advanced over the past number of years and this suit is loaded with the latest technology. This suit has additional buoyancy pads on the upper leg and hip areas to lift you higher in the water column to help you swim faster. Built with 38 cell Yamamoto neoprene you have a very flexible suit that is buoyant and super durable. The suits legs and arms are coated with SCS – a friction reducing coating that supposedly helps you glide through the water better. The arm and ankle cuffs are made from a silicone compound that helps you get the suit on and off. You will appreciate this feature alone if you struggle with your wetsuit. A final nice feature is the back of the neck. Blueseventy have lowered this a bit to stop you rubbing the neck off yourself when you are swimming. It also has the added advantage of keeping the zipper top clear. We have used Blueseventy gear for some time and are big fans of their triathlon bags so have no hesitation in recommending them as a brand or indeed their wetsuit. Just look around the next time you are lining up for your swim at the start line and you will see plenty of athletes – both beginner and pro wearing them. That’s it for now. 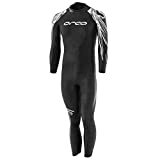 We will be adding to this review as more triathlon wetsuits come down in price and offer the same quality and features like the ones we have listed. Whatever suit you choose make sure the fit is right, you look after it and enjoy your swimming.